This I got from a wonderful blog I happened to hop on when I was just thinking about something. I was searching and this came across so I had to check into it. I really was touched by what this says so much that I wanted to share with you. In Matthew 5:3-12 we find the well known Beatitudes. This portion of Scripture is very peculiar because every statement begins with “Blessed are those…” and yet the attribute that is mentioned right after is NOT something desirable before the eyes of the world. If we were to be honest, we would all say that none of us would like to be considered poor in spirit, or be caught in the midst of mourning. Meekness is considered a sign of weakness and in America Hunger and Thirst for righteousness is replaced by hunger and thirst for worldly acceptance. It is very difficult to be merciful and pure in heart because our hearts are always seeking to satisfy our own needs; and we are not willing to make peace if that peace requires that we would submit to someone else’s authority. We do not want to be made fun of, or persecuted, or bad mouthed… Yet all of these things the LORD calls blessed! The reason why they are Blessed is because only when we have these attitudes can we truly see ourselves for who we are and God for who He is. Only when we see the depravity of our being and the sin that enslaves us, can we be set free by the only ONE that is Pure and Holy! May He grant us the privilege of being called BLESSED by Him because in us are found the Be-Attitudes. I decided to do a layout of my son when he was born. The doctor's told me to go home that this pregnancy would terminate. I had been trusting the Lord for 14 years to give us a child. My vision was finally coming to be. I relied on Habakkuk 2:3 for this. The Lord showed me so many things during my time of carrying my son. I experienced many complications along the way; although they were scary I still trusted the Lord for strength to get through that day and into the next until the baby was born. I met each complication head on with the Lord at my side and learned many lessons throughout my pregnancy. I then had the experience of my lifetime when my son came two months premature. The delivery was not easy, very traumatic for both and very scary. 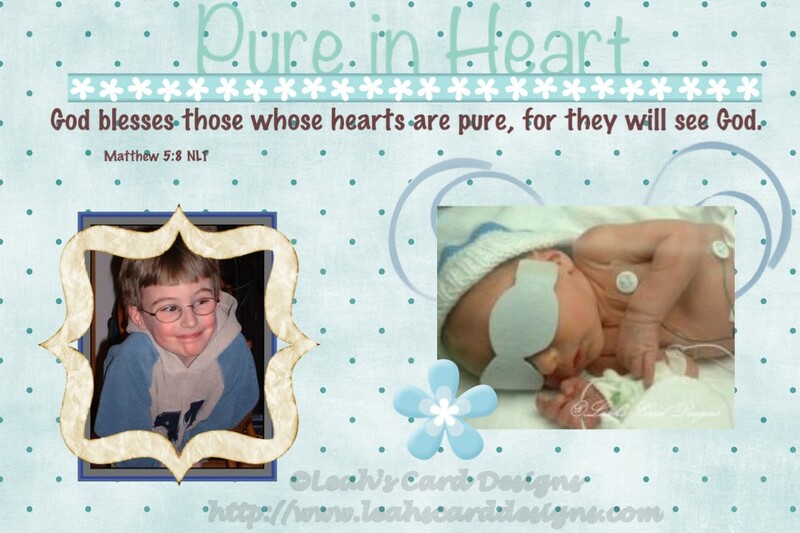 Even then I thought I had lost our son as he stopped breathing, but then God let me know HE was in control. He was because our son although had a rough first night, mostly touch and go, was still able to greet me when I went to see him. I thanked the Lord for him and allowing me to be his Mother. I say Pure in Heart with this layout because of all that he and I went through. He is pure in heart just being little and now he's a young boy of seven years old. He still holds that pure disposition. He cares for others; he places them before his needs. He plans things for people he loves to bless them ~ not for his benefit, but theirs. He did this with my Step Dad. At our son's birthday last year he decided then he was going to give my Step Dad a present at his birthday (our son's birthday). I thought why would he do this; why did he choose him out of all of our relatives. I will never know because I will never ask him. I know that my Step Dad has been through a lot from our son's last birthday to this one. I know the LORD knows our needs before we even know them. I feel that the LORD planned this using our son as the tool for him. I know he was blessed to receive the gift from him. I'm so pleased that I could be there with him when he gave this gift to him. This is just one of the things that our son has done. He has such a large heart, he is like me in many ways. He cares about what's going on with others; if someone is sad he will try and cheer them. When my Aunt was in Hospice he was with me and wanted to care for her. He did all that he was capable of and made her smile every chance he had. She was so blessed to have him there. She looked forward to the days he'd be able to be there; she'd plan things that this little one could do for her. She knew he loved her so as she did him. The two of them were so sweet together. He has given toys and clothes to other children when he learns that they don't have as much as him. He wants to make everyone smile. He has been giving a friend of mine many toys and things for her baby that she's expecting. He finds things and says this is for baby Zion Mama. I watch as he puts it in the box he has for him. I am so blessed to have him. I lost my Grandmother his Great Grandmother "Gigi" when he was just 2. I was crying he said "Mama, don't cry Gigi is in Heaven playing with Jesus" ~ how sweet of him. When my Father passed away that too was difficult for me as was for him. He was only 5 when he passed away; he has his difficult days. He sees when I'm sad. He says Mama, please don't cry Pa is in Heaven he's on his boat with Gigi and Jesus. They're having fun Mama. I am glad we have so much to be thankful for. Thank you for stopping by. Now here's the layout that I made.